Acai (ah-sigh-ee) berries are potent antioxidants as you can probably tell from the rich, deep purple colour! Acai bowls are a great smoothie alternative if you fancy something more substantial and have a bit of time on your hands (perfect for lazy Sunday mornings!) The mixed toppings such as nuts and coconut add a bit of crunch, as well as a protein kick to keep you satisfied for longer. You can buy acai in frozen packs from some specialist health food supermarkets, I found mine in my local Whole Foods. You simply whizz the frozen acai up in a food processor with other frozen fruits and a tiny splash of liquid. The result is a super thick and creamy consistency - more substance than a smoothie and the perfect base for an array of toppings! 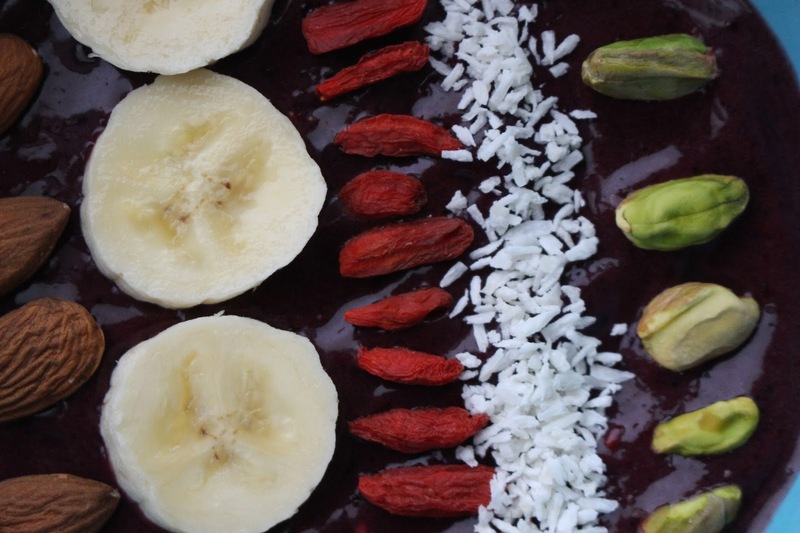 If you can't get your hands on the frozen acai, another great option is acai powder. These superfood powders are really readily available from most health shops, and can be added to a frozen banana and berry mix to provide a nutrients boost. You can really get creative with the toppings, any fresh or dried fruits, nuts, seeds (chia works great) and even cereals such as granola for an energy boost and some added crunch; try out different flavour/texture combinations to keep it varied!